Bruce Everett Miller is a 6th degree black belt in Quan Li K’an and a Physician’s Assistant. His hard to find, self-published books don’t feature glossy pictures or flashy moves. But they are true gems, full of logical, useful techniques, concepts and insights as well as explanations based on scientific and medical understandings – information not found anywhere where. For many readers he is the teacher they wish they had known long before. This book teaches techniques of muscle attacks, efficiency, breathing, nerve strikes, stances, and much more. Also included is some martial arts history you were NEVER told before as well as some nasty tricks which work on the street. Note: these books or booklets are short and concise, and produced in black and white with soft folded paper covers. They are self-published by the author, and offered for the unique quality of their information. You will find nothing elce like them. If you expect thick glossy books with color photos, however, these books are not for you. 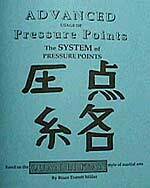 Finally, a book which reveals ALL levels of pressure point theory in terms which can be understood. Western medical terminology gives you exact explanations and locations so there is no confusion about which points work and why. Also see the companion video with the same name (BEM-V # 3010). Pressure points is a complete system! As such the system encompasses much more than simply hitting different structures of the body. The system of pressure points encompasses everything from simple pain production at the low end of the spectrum, through massive pain production to balance control, to incapacitating your opponent through his own reflexes and/or producing a knockout at the other end of the spectrum. Unlike many systems the closer you look at the system, the BETTER you will understand and the more you can use the system! Yet there is no need to memorize a massive number of rules to get in your way on the street. IF you understand the system you will know how to make it work! and you opponent will have a VERY BAD DAY! Western medical terminology gives you exact explanations and locations so there is no confusion about which points work and why. What are you going to do when you come up against a non-responder? He's big mean and ugly and he eats black belts for lunch. He knows your stuff won't work on him because it has all been tried on him before. So what are you going to do, become his next lunch? Traditional Chinese Medicine (and systems using explanations of qi or chi) does not have an answer for non-responders! (people who seem not to react to pressure point hits or pain). They can’t even explain why non-responders exist; yet everyone knows they do. In fact 15% of the population are partial or full non-responders. So what are you going to do? Hope that you can punch harder, or pray that you are quicker? No. Resort to reflex points, which ALWAYS work! So what are REFLEX POINTS and why do they always work? And more importantly how can you make them work for you? This book takes a much deeper look at the special subset of pressure points called “reflex points” and explain exactly what they are and why they work. Additionally, the author explains how you can become a non-responder yourself! 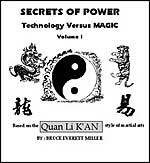 This book explains all 5 levels of the Poison Hands System (“Poison Hand” is an old Chinese term referring to the supposed ability to kill or injure an opponent with only a single light touch, or hit – often hours, days or weeks after the initial contact). Included too is the history and reasons behind why these techniques work and how to do these formerly secret techniques. 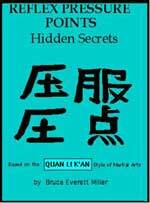 A must for those who want to understand the truth behind these ancient secrets. Also see the companion video under the same name (BEM-V # 3011). This book gives in-depth explanations about different types of relatively light force knockouts, why they work and how they are done. Great information. NOTE: ALL knockouts cause some degree of brain damage so this book is presented for educational purposes only! It's finally here. No more excuses. No more reasons why the information is or should be kept secret. Here is the final truth about Dim Mak (often referred to as the “Death Touch”) and the REAL techniques that make it work. These are the real techniques, how they work, how they are done and the real explanations to show what works and what doesn't! Be aware this book isn't the usual hype or fiction. This isn't about history or overstated claims of Dim Mak; nor just point touching, pseudo healing techniques or pseudo-scientific babble. These are actual DELAYED KILLING techniques. These are actual, complete Dim Mak techniques explained with scientific interpretation and based on actual, reproducible techniques. So if you don't want the truth--if you are not ready to SAFELY handle this knowledge--then please pass this book by. NOTE: Warning that this book contains ACTUAL delayed killing techniques and must NOT be practiced. This is not hype. You have been warned! THIS BOOK IS SOLD FOR EDUCATIONAL PURPOSES ONLY AND ANY USE OF THESE TECHNIQUES under ANY CIRCUMSTANCE is NOT ACCEPTABLE! YOU MUST BE OVER 21 YEARS OLD TO PURCHASE THIS BOOK; AND YOU MUST PROVE IT. To order this book you must send FightingArts.com a copy of a driver's license or some other acceptable form of ID proving that you are over 21. NO, this book will not be sent with parental approval. There are NO EXCEPTIONS to the over 21 rule, so don't even ask. You can order here, but the book will not be shipped until we receive your proof of age. After your order we will contact you to arrange proof of age confirmation. 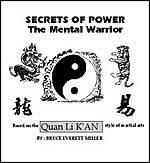 The Mental Warrior will teach you a no nonsense yet complete method for developing complete mind control WHICH WILL COMPLETELY CHANGE YOUR MARTIAL ARTS ABILITIES. The mind is the limiting factor. Forget magic; learn the real techniques! They say that Enlightenment is the highest level of advancement in any Martial Art....but they don't tell you how to get there. Forget all the mumbo jumbo; finally there is a book which teaches you how to reach enlightenment. This book is about more than just physical techniques. This book is about spiritual (not religious) and mental development and how to approach and unlock doors of understanding that you never even knew existed! 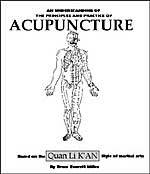 This book gives a complete explanation of how acupuncture works, PLUS techniques on how to perform acupuncture...even without needles. In addition, this volume contains information on the newest developments that have totally revolutionized the field and made acupuncture something that EVERYONE can safely practice on themselves! A special section includes explanations and special references to other books to help illustrate how acupuncture ties into martial arts. In short, if you really want to understand acupuncture, this is where you want to be! The subject of this book is a matter of LIFE or DEATH. Simply put, any misconceptions about weapons can get you killed on the street. This book covers the principles behind weapons. 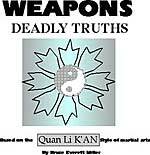 It teaches the principles of how to understand the strengths and weakness of each class of weapons. If you are even the slightest bit interested in working with, learning about, or defending yourself against weapon attacks, then you NEED this book. The bottom line is to WIN! Knowing how to fight well is essential for survival. The problem is that while many people learn to fight, few learn to fight exceptionally well. This is because of the lack of real understanding of the theories behind fighting techniques. Finally, here is a book which actually teaches you in-depth sparring theory from the ground up so you will have a complete knowledge base of what to do, when to do it, and WHY. It doesn't stop at basics, however, for included are in-depth, advanced techniques (even against multiple opponents). This book teaches you what you really need to know to win!